The Minnesota Wild fought tooth and nail to stay alive in the Stanley Cup playoffs, but Patrick Kane had other ideas as he scored the game winner in overtime to secure a 2-1 victory for the Chicago Blackhawks and a ticket to the Western Conference Final for the second consecutive season. Unlike Games 3 and 4 of the series in Minnesota, it was the road team that got on the board first as the Blackhawks took an early lead. With several Hawks players crashing the net, Versteeg chased the puck down along the goal line, and fired in a pass toward the net. The puck hit the traffic near the crease and ended up skipping past Ilya Bryzgalov, and just two minutes into the game the Blackhawks held a 1-0 lead. The Blackhawks continued to rack up some good scoring chances, with their first and fourth lines doing a lot of the heavy lifting, but momentum started to shift to the Wild a bit when they got a power play thanks to a Niklas Hjalmarsson penalty. The Blackhawks killed it off despite the Wild having the puck in the offensive zone for nearly two minutes, and Jonathan Toews got a breakaway chance in the late stages to kill off the remainder of the infraction. After Matt Cooke was sent to the box for boarding Johnny Oduya, the Blackhawks got a power play, but the Wild were able to kill it off with ease. The remaining minutes of the period passed uneventfully, and despite getting outshot by a 9-8 margin, the Blackhawks held a 1-0 lead after the first period. As the second period got underway, the Wild came out of the locker room with a newfound purpose, and they quickly scored to tie things up. After a bad turnover by Hjalmarsson, Oduya cut toward the boards and opened up a wide open lane for Erik Haula to skate through. Just as he has throughout the series, Haula made the Blackhawks pay for the open space, beating Crawford on the breakaway and tying things up at 1-1. After that goal, the tempo of the game picked up considerably. First it was Oduya to the rescue as he kicked a puck out of the crease in the defensive end. Then Patrick Sharp got a breakaway that he couldn’t convert on as Bryzgalov made the save. At the other end, Justin Fontaine got a breakaway of his own for the Wild, but with two cracks at the net, he couldn’t put a shot past Crawford as the game remained tied. The Wild got a few more chances in their end of the ice, but Peter Regin made an initial stop by firing a puck away from the feet of Jason Pominville in the crease. On the next Minnesota possession, Cody McCormick got in behind the defense on a breakaway, but Duncan Keith made a nice play to keep him from getting a clean shot. Despite this play, McCormick then spun around and executed a perfect backhanded spinning shot, but Crawford was able to make the save and keep his team in the contest. Late in the period, the Blackhawks had to dodge a couple more bullets. First it was Fontaine getting yet another breakaway, but Crawford made a huge leg save and then a glove save as Fontaine got his own rebound. After that play, Zach Parise got a chance from in close, but Crawford was able to seal off the post and prevent the Wild from scoring as it remained a 1-1 game through two periods. As the third period got underway, the Wild got an early power play thanks to a Bryan Bickell high-sticking minor, but his teammates picked him up in a big way to keep the game tied. Hjalmarsson had a key shot block in the ensuing sequence, and then Marian Hossa came up big as he won a puck battle along the boards and cleared it down the ice to finish killing off the penalty. In the first ten and a half minutes of the period, the Blackhawks didn't manage a single shot on goal, but Crawford stood tall for his team. On a power play the Wild received thanks to a Hjalmarsson delay of game penalty, Crawford made a couple of big saves, and the Hawks were no worse for wear with about seven minutes remaining in the game. As the period came to a close, the Blackhawks finally started getting some chances on net. Patrick Kane had the best opportunity of all, retrieving a loose puck near the blue line and blasting a shot in on Bryzgalov that the Russian goaltender had a tough time retrieving. He finally did cover it up, and the two teams headed to overtime deadlocked 1-1. When overtime started, the Wild began to get some great pressure on Crawford, but the Blackhawks quickly turned the game around. Regin, teamed up with Kane, started out the great pressure with a good shift, and then Bryan Bickell and Toews both picked up opportunities. Finally, Brent Seabrook blasted a shot high from the point, but Bryzgalov absorbed it to extend the game. 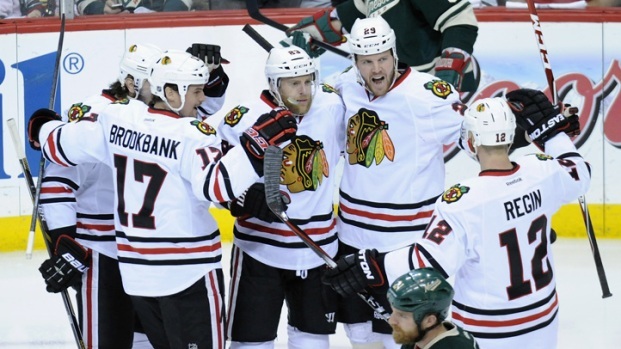 As overtime neared its halfway mark, the Blackhawks took down the victory. Seabrook fired in a shot that bounced strangely off the back boards, and Kane picked up the puck, deked it around Bryzgalov, and lifted it top shelf to give the Hawks the victory. With the win, the Blackhawks will head home and await the winner of the series between the Anaheim Ducks and Los Angeles Kings. If the Ducks win (they're up 3-2 in the series), then the Western Conference Final would open in Anaheim. If the Kings triumph, the Blackhawks will host Games 1 and 2 at the United Center.